Chanie Krasnianski, second from left, co-directs Chabad of the Upper East Side, which held its annual auction and fundraiser earlier this month. Almost 20 years ago, Rabbi Ben Tzion and Chanie Krasnianski moved to New York City’s Upper East Side to embark on a major undertaking: the establishment of a Chabad-Lubavitch center to reinvigorate one of the most historically-Jewish neighborhoods of Manhattan. They started out small, but today, seven years into its current 17,000-square-foot educational complex, the Schneerson Center for Jewish Life continues to grow, enhancing the lives of many in the process. It’s practically a 24-hour operation, with the earliest program beginning each morning at 6:45 as seven rabbis offer one-on-one counseling sessions with area businessman. Prayer services begin shortly thereafter, while a preschool quickly welcomes students. A Hebrew school teaches older kids on Sundays, adult education courses fill up residents’ nighttime schedules, and a television show on cable Channel 57 on Sunday evenings enlightens viewers on “Kabbalah and the Psychology of the Soul.” An affiliated ritual bath, known in Hebrew as a mikvah, draws on a membership of 400 women, a Friendship Circle program pairs teenage volunteers with children with special needs, and a bimonthly lecture series presents noted speakers and scholars. And then there’s the Sabbath, when everyone joins together for prayer, community meals, and inspiring discussions. Once a year, the entire community joins together for a grand celebration: a 500-strong auction at the Museum of Jewish Heritage. Sponsored by Peter Schwalbe and Jody Soltanoff, this year’s evening on Feb. 12 paired a buffet dinner with a Chinese auction and a concert by Chasidic singer Avraham Fried. Requiring months of planning, the event’s prize solicitation efforts began back in September; an auction catalogue was sent out to the mailing list well in advance of the gala. But while the celebration typically honors a few individuals for their dedication to the local community, things this year took a different tack. 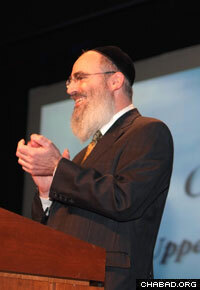 Rabbi Ben Tzion Krasnianski speaks at the annual auction benefiting Chabad of the Upper East Side. Nancy Snell and her husband got involved with the Upper East Side center about seven years ago. She heard the rabbi speak and “fell in love [with the operation] from day one,” recalled Snell, who has attended the auction five years in a row and won this year’s grand prize trip to Hawaii. “It’s an oasis for me as a Jew to have a place where I always am welcome. Stephen Kaufman has been praying at the synagogue four to five times per week for the past three years or so. He believes centers like the Upper East Side Chabad House enliven Judaism by welcoming Jews of all stripes and backgrounds. And with a wealth of programs, there’s plenty to keep people involved.